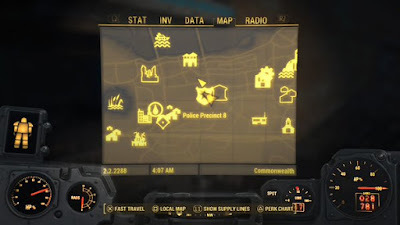 - Police Precinct 8 is located almost smack-dab in the middle of the Commonwealth, in the heart of Boston. You can find it by wandering the streets to the northeast of Diamond City. Given its proximity to the City it’s a good bet you’ll find it on your own, though it may pop up on your map while looking through the computer terminals of BADTFL Regional Office. - The Precinct is within the patrol boundaries of the Diamond City security forces, so if you approach from the west you’re not likely to run into much trouble - or at least you’ll have backup. That said, there are a few Radroaches near the entrance of the Precinct that will happily try to nibble on your legs if you try to get inside. First, there’s an evidence terminal in the Precinct’s office. It contains map details for South Boston Police Department and Natick Police Department. Second, there’s a closed cell in the rear of the Precinct. Inside you’ll find Eddie Winter Holotape 8. This item is key to a large side mission involving Nick Valentine. - ... yeah, that's really all there is to this place. Was it manned by, like, one person? Oh well.